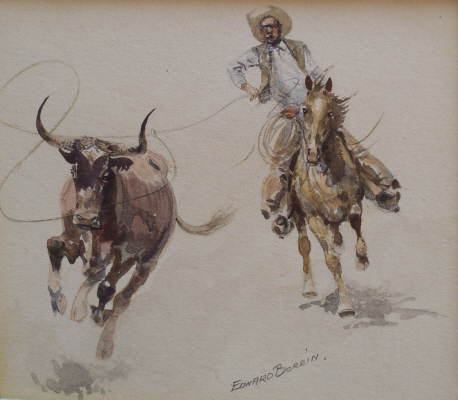 Born in San Leandro, California, Edward Borein became one of the most popular artists of western scene painting,equally adept at ink drawing, watercolor, and etching. He was raised in San Leandro, a western cow town, in a family where his father was a county politician. Edward had many childhood memories of herded cattle and their cowboys,which he began sketching at the age of five. He was educated in the Oakland, California schools and at the age of 17 began working on a ranch near Oakland and then drifted and sketched as a working cowboy throughout the Southwest,Mexico, and Guatemala. It was said that he practiced his art on anything he could find from bunkhouse walls to scraps of paper. 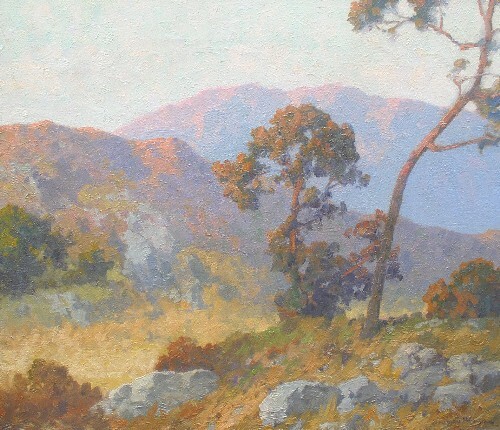 At age 19, he enrolled at the San Francisco Art School, his only formal art training, and there he met Jimmy Swinnerton and Maynard Dixon who encouraged him in his art career.The first person to purchase his work was Charles Lummis, editor of “The Land and Sunshine” magazine in California, and the two became life-long friends, and Borein and Lucille Maxwell were married in the Lummis home. Borein, a typical westerner in dress and manner, also became close friends with Charles Russell, Will Rogers, and Theodore Roosevelt. 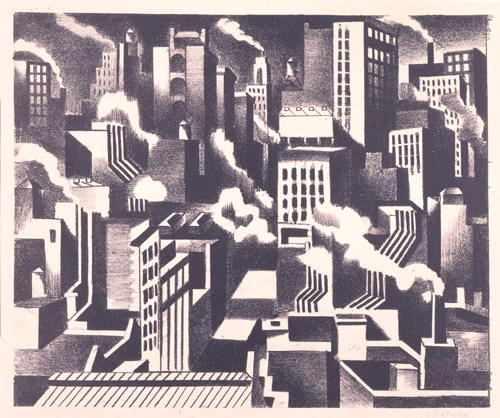 In 1899, he visited Arizona while returning from Mexico, and by 1902, he was a successful illustrator in San Francisco for the “San Francisco Call,” but in 1907 he went to New York to learn etching techniques. He enrolled in the Art Students League and was a student of Childe Hassam. In the theatre district, he opened a studio that became a gathering place for lonesome westerners such as Charles Russell, Will Rogers, Olaf Seltzer, and Oscar Borg. 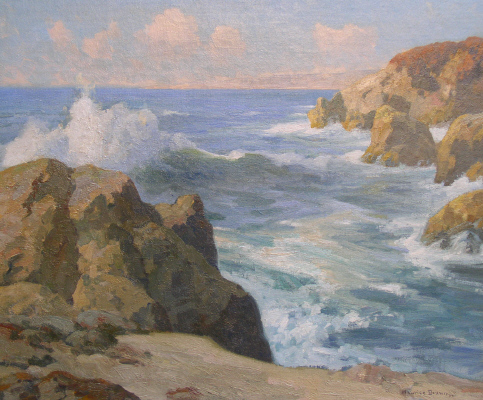 But Borein did not feel at home in New York, so he moved to Santa Barbara, California in 1921. This was a final move, and he and his wife built a Hopi-style home and he taught at the Santa Barbara School of the Arts until his death. 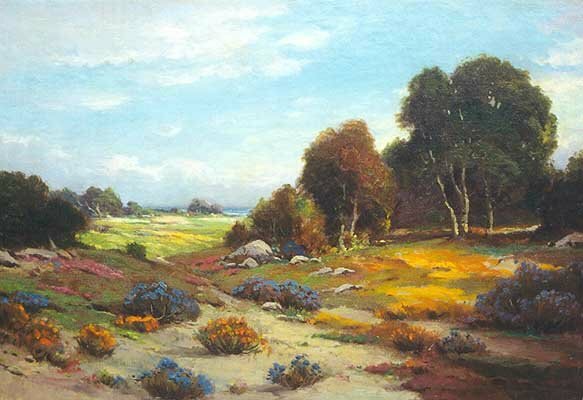 From his studio, which again attracted many of his friends, he depicted Indians, cowboys, and California ranch life.